Physical development is critical during the first five years of life. It is well documented that higher levels of physical activity in childhood can lead to continued participation in later life. It is important to establish high levels of physical activity as early as possible to encourage children to stay active enough to benefit their health and to support continued interest and participation throughout adult life. Across Leicestershire, Leicester and Rutland we are committed to driving the Early Years Physical Activity agenda forward. We work closely with a range of partners to provide local support around this agenda. Physical activity should be encouraged from birth, particularly through floor based play and water based activities in safe environments. Active children from birth to 5 years old are healthy, happy, school ready and sleep better. Children who are not yet walking should be encouraged from birth to do simple activities such as tummy time, enabling them to reach and roll for their favourite toy or acting out some nursery rhymes! Children capable of walking should be physically active for at least 3 hours each day. Play hide and seek, put some music on and move to the beat or more energetic activity like active play in the park, swimming and skipping. We organise exciting high quality training course opportunities and an annual Conference with Awards, that Early Years practitioners or anyone that works with children under the age of 5 can access. Our Purposeful Physical Play Training (PPP) is our main training course for Early Years Practitioners or anyone who works with under 5's. If you would like to help your children learn to love being active, improve their health and learning prospects and demonstrate your commitment to – this training is for you! Opportunities currently available will be listed below. 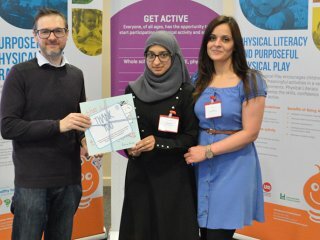 The Healthy Tots Physical Activity Guide and supporting 'Lets Get Moving' cards have been developed by Leicester-Shire & Rutland Sport and partners to support early years practitioners plan and coordinate appropriate physical activity play opportunities and environments for children under 5. 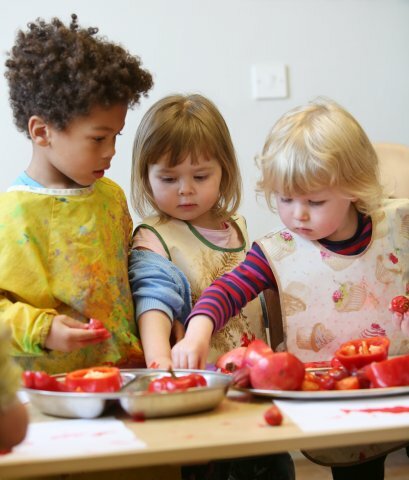 They will help practitioners meet requirements of various UK curriculums, particularly those relating to physical development within the Early Years Foundation Stage (EYFS). The Lets Get Moving cards give practical ideas of what practitioners, parents and carers can do with each age group, from 0-3 months to preschoolers. Our 'Let's Get Moving' leaflet for parents provides top tips and advice on how to encourage 0-5 year olds to be active in the home environment. Leicestershire Healthy Tots is an early year's accredited health promotion programme designed to encourage settings to promote healthy lifestyles as well as becoming health promoting environments. It was based on the National Healthy Schools model as well as similar tried and tested programmes for under-fives, established in other parts of the UK. Support young children in making healthier choices around physical activity, healthy eating and emotional health and wellbeing. Develop a framework for planning, delivering and evaluating health promotion, which is in line with the early years foundation stage. Enable all children to develop healthy lifestyles regardless of age, disability, ethnic origin, faith, gender, language, sexuality, social class or special needs. Develop links with parents, the wider community and other agencies. The resources in the section above and the Purposeful Physical Play Training will help practitioners work towards the accreditation criteria for physical activity. We are currently piloting the Twilight Tots programme which is an intergenerational piece of work to enable local settings and care homes to come together to be physically active.